Lost a Nissan car key and need a replacement? Need a new Nissan car key cut urgently? Looking for a reliable car locksmith to reprogram your Nissan key fob? Lost Your Nissan Car Key and Need A Replacement or Spare? 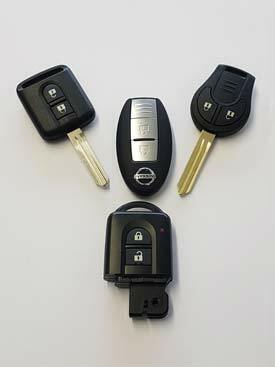 We can supply, cut & program remotes and keys for a wide range of Nissan vehicles - including smart remotes and ignition type key remotes for models such as Almera, Primera, Micra, Leaf, Juke, Note, Pathfinder Quashqai, Pulsar, XTrail, Navara, NV-200, NV-300, NV-400, Murano and Primastar. Available 24/7, we can provide rapid response exactly when you need it. Our expert team can provide a range of auto locksmith services on the roadside, at your place of work or garage premises. We aim to get you back on the road as fast as possible. We can guarantee the most reliable, efficient and cost effective services possible, ranging from opening locked Nissans to changing Nissan lock combinations. If you have had your car keys stolen and need help urgently, any lost or stolen Nissan keys can be deleted from the vehicle, so they will never work again. Providing automotive locksmith services across the Midlands, Shropshire, Staffordshire, Herefordshire, Worcestershire and Warwickshire, we are committed to offering the best vehicle locksmith services possible.